Laughter is the best medicine. Well that, and Spectrum. Spectrum Healthcare Partners. Weâ&#x20AC;&#x2122;re Spectrum, a team of individual specialty practices that have been in your communities for years. Only now, we are working together under a new name and with a singular focus: to make patient care experiences simple, seamless and more affordable. Track Club board Members enjoying a group run as part of their annual bRUNch meeting. Cyclists: Trek Across Maine, photo courtesy ofTrek Across Maine/Karsten Moran. GET YOUR RACES & FITNESS WITH A SIDE OF CRAFT BEER & ADVENTURE TO SAVE $10! Be the first to receive RaceME for local race events, fitness, nutrition and wellness and find more fun by adding two more titles! 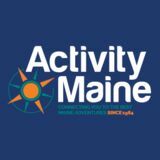 Activity Maine's 2 seasonal publications are packed with year-round adventures, outdoor tips and gear. Plus receive 2 issues of the popular Maine Brew Guide that brings you the best of Maine's hot brewing scene! ALL FOR $15.95! to keep a slim figure and that this can be achieved by eating the bare minimum needed to sustain performance. ■■ What is my nutrient timing through out the day? ■■ What daily and performance supplements do I take? toward your daily training goals. to nutrition and what is “healthy”. Refueling with chocolate milk for mid work out break; Above: Assessing lean muscle mass through anthropometric measurements. Our mission is to help you attain your marketing and fund raising goals and stand out in front of this compet­itive crowd. Increase your event registra­tions, reach your funding goals faster, and achieve awareness for the cause you are supporting. RaceME is your solution to stay prominent in the hearts and minds of any level athlete, community volunteers and participants. RUN 5TH ANNUAL KIPPIE’S 5K RUN/WALK/ROLL. course surrounded by beautiful water views. A post race Lobster Bake with the following options; lobster, steak, chicken, vegetarian and children’s meals. Plus Maine’s finest craft beer! There is a kids’ race where all finishers receive a medal at finish line. For the adults, awards given to the top 3 male and female finishers. FMI and to register visit: mainetrackclub. com and click on Race Info. August 3: Takes place along the shores of Cape Elizabeth. Founded by Olympic gold medalist Joan Benoit Samuelson, 2019 marks the 22nd running of Maine’s largest road race, featuring top world-class and New England runners in a field of 6,800+. FMI: visit WWW.BEACH2BEACON.ORG This year the race beneficiary is The Telling Room. Maine’s only youth-focused literary arts organization, offering innovative, effective and often life-changing writing programs for more than 4,000 Maine kids each year. Their programs reach students from nearly 100 schools in 70 towns across the state annually, including those from diverse backgrounds and experiences, and all core programs are 100% free to students and their families. To learn more about the Telling Room’s programs, visit WWW. TELLINGROOM.ORG. 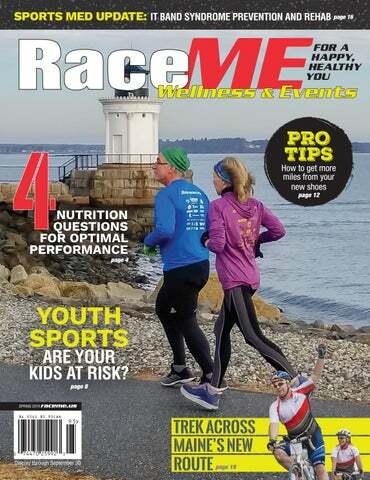 October 6: Info and registration: WWW.MAINEMARATHON.COM. PORTLAND TRAIL TO ALE 10K RACE/WALK 20TH ANNIVERSARY! apply to all branches of a discipline. sport coaches: start your kids young. corners the market on these skills. any posture specific to a single sport. tennis players struggle to hip hinge. prices of burnout and overuse injuries. early phenomenon and find more clues. due to injury and burnout. Jimmy’s “elite” summer hockey league. movements will change due to fatigue. Stop the car and let him go play. GEAR HIGHLIGHT: Brooks Adrenaline GTS 19 features their GuideRails Holistic Support SystemGuideRails are designed to keep you moving comfortably by keeping excess movement in check. learn about trends we can expect to see in running gear this year. shopping for the next pair of shoes. A Fleet Feet and Karhu Collaboration The Karhu Ikoni is a revolutionary development in the world of running shoes. This shoe was shaped by footscan data from more than 100,000 Fleet Feet fit id images (see more about fit id below). That means real feet dictated the specific design of the shoe and that Fleet Feet customers, owners and employees (maybe even you?) are part of development process. Stop into either Maine Fleet Feet store location and find out more information about this unique footwear. Erin recommends to go by feel. We like to keep things fun and unique, so many of our programs include course preview runs, demo runs with vendors, clinics, fun runs, and more! The training programs that we offer are so much more than just working out. By joining us for your training experience, you will be taking part in programs with experienced coaches helping to guide you, numerous running friends who will keep you going, and structured workouts designed to help you achieve your race-day goals! Our training programs are very social, but still maintain a strong focus on running and motivation to help you reach your fitness goals. Many of our participants have gained meaningful and fun friendships with other group members during their fitness journeys. PHOTOS Courtesy of Fleet Feet Sports Maine Running. halfway through the life of your main running shoe and and slowly incorporate it in. This allows your main shoes longer time to recover between runs, which allow them to maintain their structural integrity for longer. washing machine. Instead, use a sponge and a toothbrush with soap and water. If you do get your shoes soaking wet on a run, take the laces and inserts out and let all parts dry completely. chocolate milk as part of their recovery routine. And science supports what elite athletes have known for years: Chocolate Lowfat Milk has what it takes to help you recover. So after you’ve worked up a serious sweat, leave carbheavy ‘sports drinks’ behind and replenish and restore with Oakhurst chocolate milk. Drink lowfat chocolate milk within about 15-45 minutes after a workout or between multiple exercise events. 16 ounce serving offers the perfect mix of high quality proteins and carbohydrates to build and repair muscles, and water and electrolytes to replace what you lose through sweat, preventing dehydration. Oakhurst chocolate milk also boasts plenty of Calcium and Vitamin D to build and maintain strong bones and help prevent injury. And the sodium and sugar in chocolate milk help recovering athletes retain water and regain energy post-workout! At Oakhurst, we support active healthy lifestyles – and so when you and your kids are finished exercising, remember to reach for Oakhurst Chocolate Lowfat Milk – a delicious way to replenish and restore. After you’ve given your all, get it back – with Oakhurst Chocolate Lowfat Milk! After they give it all, help them get it back with Oakhurst Chocolate Milk. TRAIN ON YOUR SCHEDULE TRY BEFORE YOU BUY! $200 RACEME DISCOUNT on Cardio Equipment! hit Plogger’s Pay Dirt! 2019 New Year’s Day haul! The author with the plogging spoils, all 32 pounds. a frozen disposable diaper. Yes, I was wearing gloves. Anyone can plog, you don’t need fancy shoes or moisture-wicking clothing. Just stuff a couple bags in your pocket (reusables are best) head out the door and start walking or running. You don’t know what you’ll discover. Bruce Rayner lives and plogs in Cape Elizabeth. He’s Chief Green Officer of Athletes for a Fit Planet and a member of the Maine Track Club. On March 11, the Town of Cape Elizabeth voted to make two weeks a year official Plogging Weeks – the week of Earth Day, April 2128, and the week of Indigenous People’s Day, October 14-21.
gym, or even taking a breather over the winter months. But, whenever itâ&#x20AC;&#x2122;s time to get back out on the road anytime after a running hiatus, runners in particular, need to be cognizant of developing overuse injuries as they get back into training. By keeping a few key points in mind, athletes can prevent or significantly decrease the severity of these frustrating (and sometimes devastating) injuries. athletes are at highest risk. ■■ Allow a rest day once per week. pronate, also places runners at risk. more than 10% per week. meniscus tears and stress fractures. MUSCLE RECOVERY RELAXATION PAIN MANAGEMENT MEDITATION Relieve aching muscles and clear your mind! Floating in warm, Epsom salt saturated water reduces inﬂammation, cortisol production and can help you to reach a deep meditative state. COME IN AND FLOAT YOUR CARES AWAY!! THE TREK ACROSS MAINE has a new route for the event’s 35th anniversary on Father’s Day weekend, June 14-16. The route will showcase more Maine cities and towns and offers a virtual option to increase fundraising. Since 1985, the annual event has raised more than $24 million and is the largest fundraising event in the country for the American Lung Association. The 180-mile route is designed to provide a positive and safe riding experience for cyclists and have a large economic impact for several new regions along the route. With a new start line in Brunswick, organizers expect to draw more cyclists from the southern part of the state and across New England. The new route offers one-, two- and three-day options and creates efficiencies for riders and an opportunity for the American Lung Association to raise additional funds to help save lives by improving lung health through research, education and advocacy. “We’re really excited about the new route for 2019. This is something our current riders expressed interest in, and we felt that it would be a great way to celebrate our 35th anniversary. We are very grateful to the people and places that have helped with the event during the past 30 years. We also recognize that to maintain the success of the event and attract a new generation of riders, we need a route that will provide a different experience for our loyal riders, as well as create an opportunity to increase sports tourism in Maine by attracting more first-time riders,” said Jeff Seyler, chief division officer of the American Lung Association. The new route will start at Brunswick Landing in Brunswick and take cyclists through new cities and towns that include Augusta, Auburn, Bath, Belgrade, Brunswick, Freeport and Lewiston. The route will include several bike trails, including the Kennebec River Rail Trail in Augusta and the Androscoggin River Bicycle and Pedestrian Path in Brunswick. There will be several new rest stops, including at L.L. Bean in Freeport, and the popular tradition of Team Tent City at Colby College in Waterville will continue. The new virtual Trek allows cyclists or fitness enthusiasts to use their smart devices to track fitness goals for exercise options that are equivalent to the Trek experience. May 11: 20 miles-compass run, mountain bike, climbing wall and paddle (canoe or kayak). Location: East Grand School, Danforth. Extra challenges may include climbing wall, mud pit crawl, log rolling, etc. 9 Divisions: High School, Adult, Family, Open, Jr/Sr. (Open division can be a relay team, solo, teams of any size. In short, anything that doesn't fit into the other divisions can compete in the open division. Family division leaves out the biking leg…great for families with younger kids and those not up for the biking leg). Over $1000.00 in student prizes! All racers entered into a drawing for a new Old Town Discovery Canoe and 2-North Maine Woods Family passes valued at $280 each Registration: Pre-registration required. 7:30-8:00am check-in at East Grand High. $20 per person, $30.00 per person the day of the event. Contact: Dave Conley, phone 551-8729, email: DAVE@CANOETHEWILD. COM Download forms on line at CANOETHEWILD.COM/EAST-GRANDADVENTURE-RACE Registration fee includes t-shirt, lunch and awards. BOOTHBAY HARBOR FEST 1/2 MARATHON & 5K September 1: 8:00 am - This scenic half marathon course offers miles of water views, from inner harbor, to open ocean, to lakes and tidal rivers. It crosses over two islands and a historic footbridge. It passes by three ocean-side parks, and through the waterfront harbor village. The 5K course winds through one of Boothbay Region Land Trust Preserves on the peninsula and takes place in a wooded nature preserve. Both races are picturesque and iconic coast of Maine experiences, which makes this an ideal destination race for a family vacation. To register visit: RACEWIRE.COM/REGISTER.PHP?ID=10177. FMI on other Harbor Fest events visit WWW.BOOTHBAYHARBORFEST.COM. You donâ&#x20AC;&#x2122;t have to be an athlete to injure yourself like one. We understand that every move counts. As your expert source for sports injury treatment, we connect our experience with advanced medical technology and supportive care to return you to your busy life â&#x20AC;&#x201C; quickly.